What’s Black & White and Red all over? It’s a Meadowhawk dragonfly! New Hampshire is full of these handsome critters. Every morning, coffee and camera in hand, I sit on the deck watching the shadows being slowly chased away by the morning sun. Sharing space with me are my cat reclined at my feet, a multitude of birds at the feeders, hummingbirds and insects scurrying here and there. My favorite of all the insects right now are the dragonflies. In the dryness of late summer, the yard is alive with iridescent greens, blues, yellow, orange and brown and these wonderful bright red dragonflies that light on any and every sunny horizontal surface. Like tiny helicopters, they hover, they flit here and there, backwards, forwards, up and down… and occasionally land on me. 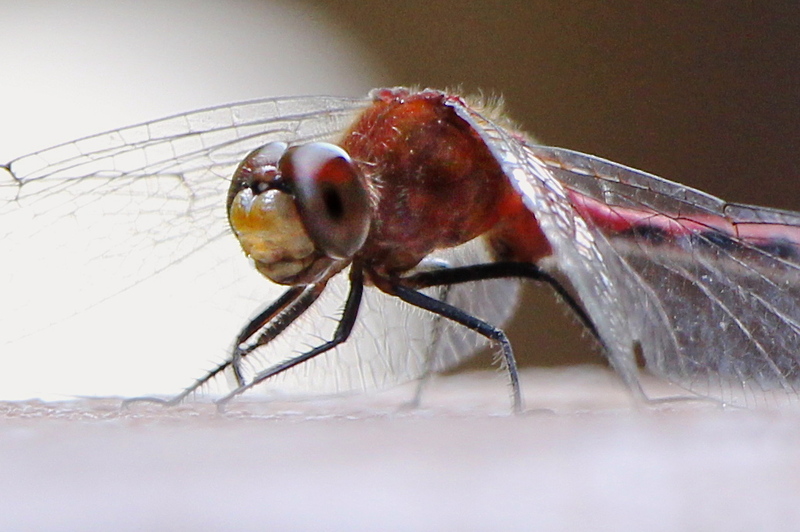 Some dragonflies are skittish but not my bright red Meadowhawk friends. They see my camera and actually seem to pose. From checking ID’s online, I believe our little dragonflies are Cherry-faced Meadowhawks (Sympetrum internum), one of the skimmers. It’s a confusing business with several look-alikes so I could be quite wrong. The true ID lies in examination of the genitalia. Starting out more brown in color, the male above turned bright red at maturity. The majority of his life has been spent in water as a nymph, but at maturity, his destiny is to eat, mate, eat, mate, and die. What a life. Abundant species in New Hampshire, but not in the Tidewater area of my home state of Virginia, the Cherry-faced Meadowhawk ranges from Alaska east to the Hudson Bay, from areas of California east to Pennsylvania and Northern Virginia. With damselflies, dragonflies are members of the insect order Odonata, ‘ondon’ meaning tooth in Greek. Both use their formidable jaws, never to bite us, but, to eat a variety of insects… including ones we don’t want around, like mosquitoes and flies. The easiest way to tell a dragonfly from a damselfly is how their wings rest when perched. Damselflies hold their wings together above their body and the dragonflies, like our meadowhawk below, will spread their wings open when at rest. Hello handsome. Is he taking a bow? This entry was posted in Horticulture and tagged Cherry-faced Meadowhawk, Dragonfly, insects, New Hampshire by Annie. Bookmark the permalink. I too have been seeing lots of dragonflies! Beautiful and I love learning more about them! Thanks!! 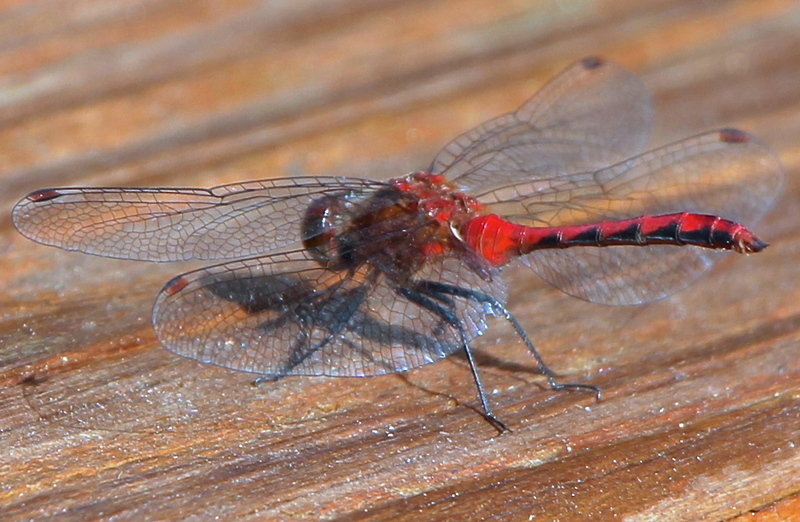 We have noticed that the dragonfly is your computer icon, but not this red meadowhawk, which is a fantastic looking creature also. The Virginia weather has produced large numbers of the usual varieties of dragonflies as well. Fascinating to watch, and like you say, put on a show for us while gobbling our enemy insects. My favorite here are the larger ones that seem to have a dusty and bright blue. Yes, one of my brothers, who has a way with all creatures and more patient than most, regularly gets one to perch on his finger as he simply holds still by his pond! It is an amazing insect. They are one of the earliest, predating the dinosaur by about a hundred million years. Fossils show they were HUGE, measuring 30″ from wing tip to wing tip. Plus I have read that it may be the first insect to fly. I have orange ones that likes to hand around my pond. I hope they are eating all of the mosquitoes. … and flies and Japanese beetles and brown widows! Just noticed yesterday that the dragonflies were back, always a joyful sight!